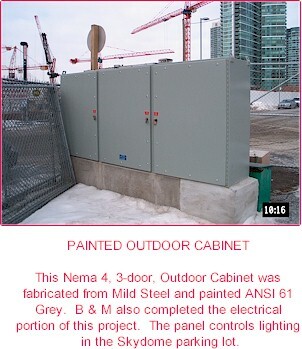 Our aluminum cabinetry and products are fabricated from all grades of aluminum in 30 gauge to 0.25" thicknesses. All products are available in anodized, buffed, grained, painted, or polished finishes. B & M produces a number of custom decorative products. We have fabricated: stainless steel checker plate stone guards, tread plates, and tool boxes for transport trucks; stainless steel box caps and aluminum stone guards and running boards for pick up trucks; and mirror polish stainless steel nose wraps and panels for utility and livestock trailers. 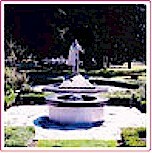 B & M was commissioned by Magical Waters Fountains Ltd. to fabricate and engrave the one-piece, polished stainless steel fountain encasement shown in this photograph. The fountain, engraved with the words "These flowers are like the pleasure of the world: Cymbeline, Act IV, Scene II", can be seen in the Elizabethan Garden at the world renowned Stratford Shakespearian Festival Theatre. We can design a product to suit your needs from as little as a verbal description. Our CAD design service is available to produce drawings on disk or in print. B & M is a fully equipped fabrication shop with brake presses, iron workers, punches, and shears. 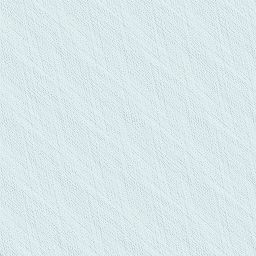 We provide custom shearing, punching, and forming up to 10 feet wide in 30 gauge to 0.25 inches. We also provide plasma cutting to 0.50 inches. In addition to sheet steel, these services are available for structural steels, angle, bar, channel, I-beam, and tubing. 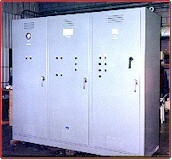 Fiberglass enclosures are available by special order in a variety of sizes. B & M fabricates gun cabinets for the safe and secure storage of firearms. 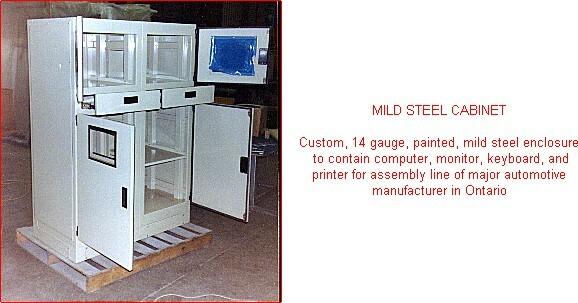 Our standard cabinets are fabricated from heavy duty, 14 gauge mild steel with a metallic gray, hammertone finish. They close with two special, security latches and have a padlock hasp. Measuring 66" high with an 18" width and depth, there is ample room for rifles and hand guns. 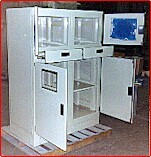 Cabinets can be custom designed to suit the requirements of your collection. B & M's expert craftsmanship and ability to product superior stainless steel products has made our Custom Boat Accessories extremely popular. So much so, we have had to dedicate an entire page to these products. To go to our Marine Products page, click on the photo to the left, showing a Custom Bow Pulpit, Sprit, and Anchor Roller System fabricated in 316 Stainless Steel by B & M.
Our mild steel cabinetry and products are fabricated from cold rolled and hot rolled, pickled & oiled mild steel in 30 gauge to 0.25" thicknesses. Finishes include anodized, galvanized, and custom painted. We offer a full range of smooth and textured paint finishes including air-dried, baked, and powder coated in the colour of your choice. 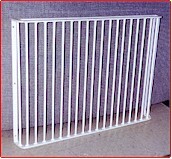 Our security bars are custom designed to fit your entry way and come with required mounting hardware for immediate installation. Our standard features ensure they are built to last with an all welded construction, 1/4" and up diameter bars, and a painted finish. Alternate options are available including choice of construction material, bar diameter, paint colour, etc. Our stainless steel cabinetry and products are fabricated in 304, 304L, and 316 stainless steel with 2B and #4 polished finishes. We always have a large stock of stainless steel on hand in 30 gauge to 0.25" thicknesses. Utility and special purpose trailers including enclosed and flat bed varities. Custom built in mild steel or aluminum. Our welders are experienced MIG and TIG welders. Aluminum and stainless welding is our specialty! Our mobile welding service is available for off-site projects.